Custom built redwood planters for your garden. We have been building some really amazing garden boxes this year and would love to build for you. We make elevated boxes for people who do not want to, or can not tend the garden on the ground. These are varied sizes based on your needs. 48 x 24 x 32″ tall is the most common. These are built to last for many many seasons. This planter is our top requested planters. We make more traditional style planters with the boards running horizontal. These are commonly 48x48x12″ deep, and can be made 48x48x18″. These are not the kits you get from the box stores. These are hand crafted solid boxes built with screws and solid redwood framed inside and out. If you want a different size, just call, email or text for a quote. Mention you want the horizontal style. We make our best selling design, the vertical board planters. These are totally custom and build to order. See the pics for previous planters we have built. These are made with 1/4″ gaps between the boards for aeration of the plants root system. Made to have a draining bottom so you can use it anywhere, patio, deck, backyard, on soil, on your porch. The prices are based on size and application, so email, text or call for a quote. We give discounts for multiple planter purchases and will deliver for a nominal fee. 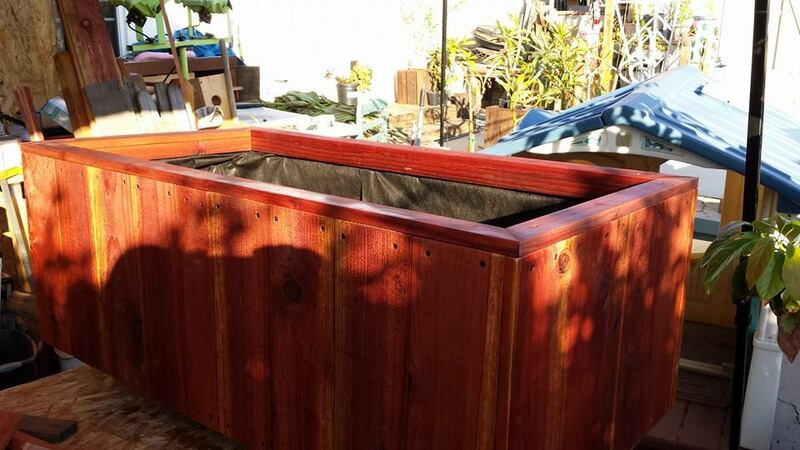 This entry was posted in custom, planters, redwood, Uncategorized on June 11, 2013 by admin.